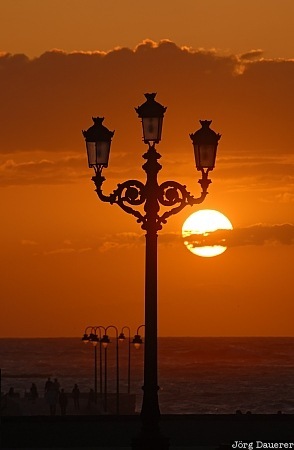 The sun is setting behind the lamps of the Causeway to the island with Castillo de San Sebastian in Cadiz, Andalusia, Spain. This photo was taken in the evening of a sunny day in April of 2008. This photo is part of the exhibition Street Lamps (July 2008). This photo was taken with a digital camera.